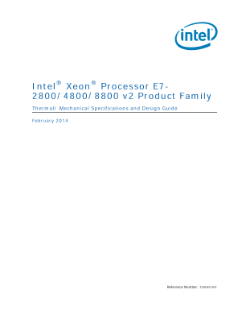 Guide: Provides specifications and guidelines to explain and demonstrate the thermal and mechanical design features and requirements of an Intel® Xeon® processor E7-2800, E7-4800, and E7-8800 v2 product family-based server solution. Intel® Xeon® processor E7 v2-based servers provide performance, reliability, and scalability. Digital services and real-time advanced analytics deliver personalized products and services. Discusses how Intel® Xeon® processor E7 v2 family-based systems lower latency and risk.